When I first heard the word hypnobirthing, I was pretty sure it wasn't something I'd want to experience! The name made me think of weird spiritual rituals and "earth mothers" and neither of those are terms I'd associate myself with. But that couldn't be further from the truth. Once I'd heard firsthand from my friend about the difference that hypnobirthing techniques made to her labour, I knew I wanted to try it. I've now had two babies using hypnobirthing techniques and I cannot begin to express how much they helped me; not just with drug-free pain management during my labours but also in reducing anxiety that I felt about giving birth. It really gave me the tools I needed to stay as in control as possible. Abbie is such a fantastic support through the whole process ... so much so that I could hear her voice during my labours reminding me of what I could do to work with, not against, my body. The midwives said I "breathed out" my second baby. Thank you mybirth! My partner and I took Abi’s hypnobirthing class in December 2017. We were quite late in starting, at 35 weeks, but I don’t think that was a problem and I still benefited a lot from it. Abi was very flexible with times, dates and locations for each meeting – she came to our home for 3 of the sessions, and we went to her for one. Abi was very laid back, and put us at ease straight away. She seemed genuinely interested in us and our birthing process. She is a wealth of knowledge on all things relating to labouring, hypnobirthing and bringing a little person into this world. Previous to staring Hypnobirthing I was terrified about giving birth. The course helped me rethinking my beliefs around birthing and the labour process, and positively reframe them. I had always believed that birth had to be a traumatic experience, and something that is ‘done to a woman’ by Drs who always know what’s best. Abi helped me challenge these assumptions and realise that I could be in control of labour and the birth of my son. Throughout the labour I used the breathing exercises and visualisations that I had practiced in hypnobirthing. Hypnobirthing also gave my partner tools to support me. In a way, nothing can prepare you for giving birth, however I believe the course allowed me to have the best experience possible for me. I would recommend the course to anyone who may be apprehensive about birth, and would highly recommend Abi as a teacher. Jonny and I decided to try hypnobirthing after friends had recommended it as a way of preparing both parents for birth. Other antenatal classes in our area were just for the female and we wanted something we could do together. We also liked that hypobirthing encourages the birthing partner to be involved in the process, it gives them a role in preparing and encouraging their partner through birth. If I’m honest we were both probably sceptical about some aspects of hyponobirthing but definitely keen to give it a go! I found the hypobirthing book really helpful. It was great to read about how my body is made to birth my baby. I was reminded of how amazing our bodies are and how miraculous the whole process of making and birthing a baby is. I found learning what my body was doing at each stage of birth helped me to prepare and made me less scared. It also made a lot of sense to me that the more you are relaxed and not scared, your body will relax and therefore the birth will likely be easier. The hypobirthing sessions were a special time where Jonny and I could forget about everything else going on and just focus on our baby. Often a lot of preparation for a baby involves buying stuff or getting the house ready and so it was lovely to focus on this life inside me and how we will bring her into the world. We both learnt a lot about how to make birthing as easy as possible, even if Jonny fell asleep every time we practiced a relaxation technique! When the time came for the birth we felt we had prepared and we had some tools to draw upon to help us. Once the surges had started we spent the whole day around the house and used relaxation, breathing exercises and had a few walks round the village to keep me moving. In the hospital I continued using the relaxation techniques but I found it less easy to keep totally calm there. For the last few hours I went into the birthing pool which was great and helped me go into a deeper level of relaxation. Our midwife was so encouraging and let us continue as we had been doing. In the end our wee baby arrived sooner than the midwife was expecting. The midwife lifted her out of the water and put her on my chest. It was the most overwhelming and emotional moment. She was a girl. Now we know her as our wonderful little daughter Lucy. I was so pleased she was safe and really happy that we had managed to do it together. I am so thankful that Lucy arrived with us safely. I think what we learnt through hypnobirthing definitely helped us to keen calm and most of all helped us to be a team throughout the process. At 2am on the 8th November 2017 at 39 weeks pregnant I woke up needing the bathroom and my waters broke. I phoned the hospital who advised me to come in to confirm if baby’s head was engaged. Upon arriving at hospital we were quickly informed that baby’s head was indeed engaged and were discharged to see what would happen over the next 24 hours. At this point I was fully expecting that we’d be back to discuss induction and was glad that we were fully informed of the risks of both being induced and delaying induction. "The fact we were so well informed is one of the unexpected gems of hypnobirthing"
During our course with Abi we were able to discuss all the evidence for each option regarding induction (and various other medical interventions) without bias; allowing us to make independent, fully informed, evidence based decisions rather than being overly influenced by healthcare staff who are often influenced by local protocols (I would know – I am an NHS manager!). Fortunately our knowledge of induction was not required – this baby was on the way! We returned from hospital and attempted to go back to bed. However, we were both wide awake and soon I started to get pain in my back which I suspected meant things were happening. Over the next few hours I dosed between surges and used the relaxation scripts and breathing exercises we had done as part of our hypnobirthing practice – these were really helpful for me as I was able to keep calm and embrace the natural process of labour. "Previously I’d always associated pain with something being wrong; hypnobirthing helped me embrace pain as a productive and positive process – with every surge my baby was closer to arriving!" Another useful strategy with hypnobirthing was allowing my husband to manage the practicalities; from cancelling our plans for the rest of the week to liaising with the hospital. With my husband doing everything practical I was able to focus on staying relaxed and breathing through the surges. Late morning to early lunchtime the surges became stronger and stronger; I could no longer eat and had thrown up between surges. Although the surges appeared to only be coming every 6 to 8 minutes, we opted to go into hospital. "I was found to be fully dilated and the knowledge I had come this far with no pain relief encouraged me to proceed as I was with the addition of gas and air." Labour then continued to progress smoothly and again the midwives respected my wishes by not coaching me to push. However after a while I was struggling to cope with the surges and wanted to get the baby out. The midwife gently suggested that the fastest way to do this was if she coached me to push and I agreed to take this step. Our baby daughter was born at 5:56PM – just under 16 hours after waters breaking. The techniques and knowledge hypnobirthing provided enabled me to make fully informed decisions at every point throughout labour and empowered me to bring my daughter into the world with minimal pain relief and medical management. The hospital team looking after me respected my wishes every step of the way so any deviation from hypnobirthing techniques was purely my own decision! This resulted in a very positive birth experience – the midwives looking after me were even able to tell that I was hypnobirthing without looking at my notes emphasising the difference it makes to labour and delivery! My husband and I heard about Abi’s class from a friend who had been through the course. We generally try to approach things in life with a good attitude, and it sounded like hypnobirthing was simply that, for childbirth. From the 4 sessions with Abi we found it to be that, but also so much more. "The knowledge and understanding we gained from the sessions gave us a huge sense of confidence going into labour that we didn’t have before." We were more confident in our plan, our choices and also really aware of all the different ways things might play out. By contrast, our antenatal classes we attended through our local hospital we found to be fairly opinionated, and hardly reassuring nor encouraging towards women hoping to give birth naturally! Our labour actually did not go according to plan, but it was then that we were the most thankful to have gone through hypnobirthing. We are convinced that it was all the preparation we did ahead of time that made our labour story something we look back on so fondly despite it being tough. I am actually from America and so had no idea what to expect when it came to giving birth in the UK. I knew I wanted to have a natural birth with little to no pain meds. I ended up having a caesarian section after being in and out of latent phase labour for 4 days. This is the last thing we wanted to happen; however, I am confident that we did everything we could have given the circumstances to have the birth we wanted – and that is 100% thanks to Abi and her course. 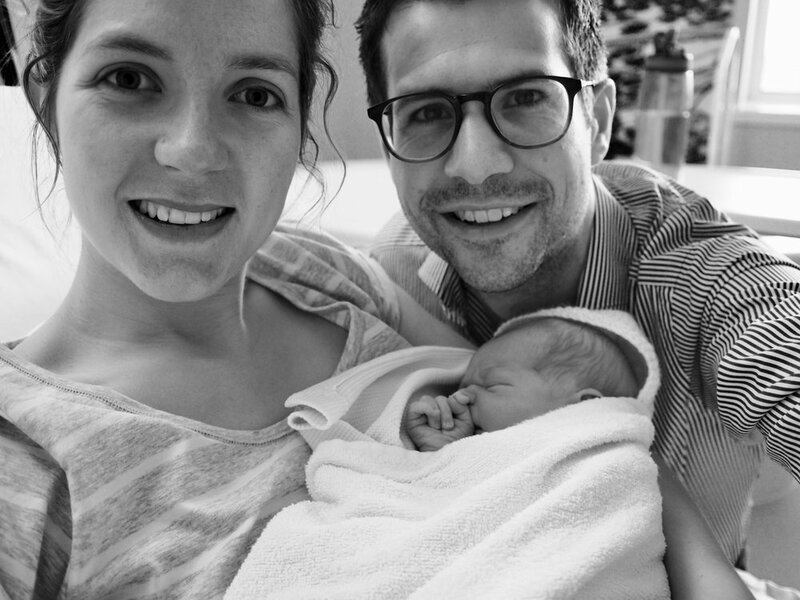 "My husband and I LOVED our labour experience and I don’t think I’d feel the same way had I not taken her hypnobirthing course."